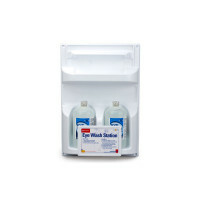 Double Eye Wash Stations: Two 16 oz or two 32 oz eye wash bottles with convenient wall mount backboard including eye wash sign. Also see our Eye Wash Bottles for replacement. Dual Bottle Eye Wash Stations & Refills - Ready for Emergency Eye Safety! When you need eye wash, or eye wash refills, our dual eye wash station is a solution for workplace eye protection. These First Aid Only Eye Wash Stations help you comply with ANSI Z358.1 requirements for safety eyewash stations. Our emergency eye wash station, is designed to meet OSHA requirements for eyewash station and industrial eyewash solution. If you have questions about Emergency Eyewash, or need to replace or refill your industrial Eye Wash Station, try our emergency eye wash or other, osha eyewash stations. 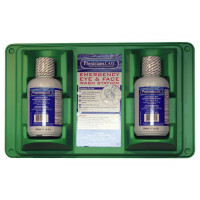 We carry everything you need, even, emergency eye wash showers and emergency eye wash signs. These emergency eyewash bottles meet emergency eye wash requirements, and fit many emergency eyewash kits that are built to suit emergency eye wash regulations & eye wash station regulations, Save here - Wholesale to the Public Manufacturer Direct Safety Product Sales since 1993.